Front Row .. 1.Thomas Piggot .. 2. morrow .. I am Brian Piggot originally of Landressy St now just outside Toronto Canada . I have received much pleasure looking at your great site over the years and thank you for your commitment to preserving not just Glasgow history but its peoples history . My late father Thomas Piggot was born on Kerr St in July 1934 and raised at 549 London Rd attending John St Secondary . Dad was a member of the 155 BB out of Bridgeton Methodist next to my old home at 30 Landressy . 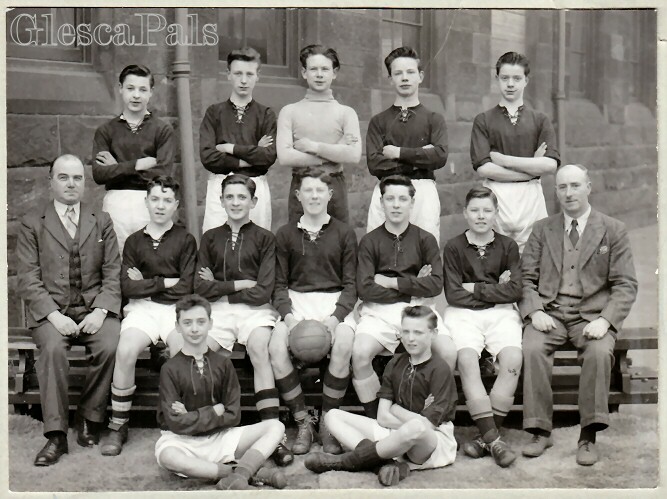 I have attached pis of two John St fitbaw teams I dont have exact years for the teams . I think St 1 was about 1949 with dad seated on ground left side , the other about 1947 dad seated on ground rt side . I have some fitbaw pics of when John St won City Championships that i will have to search my sisters house for . The other teacher in the second photo 1949 was Mr MacKinnon who was the head gym Teacher.